What does "Tone of the Nervous System" really mean? One thing hardly ever discussed is the tone of the Central Nervous System (CNS) and the importance of tone for health and wellbeing. What does it mean the tone of the nervous system? Are we talking about a musical instrument? For the CNS to work properly, the spinal cord has a set length, resonance frequency and tone in order for it to send appropriate signals out to the body. The spinal cord length, frequency and tone are completely dependent on mechanical tension placed on the cord. To understand spinal cord tension and tone and its relationship with cord attachments, it is easier to think of the spine as a guitar and the spinal cord as a guitar string. Have you ever watched a skilled guitarist tune his guitar? Imagine him playing along then stopping as he hears an off note. He crouches down to listen intently to notes from one string as he gently and gradually adjusts the tuning peg. Once tuned, he continues playing as if nothing happened! What is he doing while he is winding or unwinding the tuning peg on the end of the guitar string? 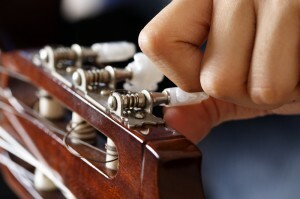 The amount of tension in the guitar string determines the note and hence the tone that plays when you pluck the string. The skill of the musician is to be able to perfectly tune the guitar to make beautiful music. Now try to imagine that your spine is a funny looking guitar, with tuning pegs at both ends and an extra peg right at the tip of the neck (skull) which can also change the tension of all the strings. The mechanical tension on the cord arises from where the ligaments attach the from cord to the bone to suspend itself within the spine. These ligaments are at the top and bottom of the spine. A Chiropractor can now tune the spine and change the tension in the spinal cord from either end of the spine. The guitar and guitar string analogy is perfect to describe the relationship between your spinal column and your spinal cord. The tuning pegs are those small ligaments suspending the spinal cord. The frequency and tone is determined by the amount of tension placed at either end of the cord. Just like the guitar string, the tightness of the cord determines the tune that is being played. When the tone of the spinal cord is healthy, the target organ receives the appropriate neurochemical release. The tone affects your level of consciousness and awareness, your mood, as well as the metabolic and hormonal functions of your body. Discover more about your tone.